The Uttarakhand floods is the worst hit disaster that all of us know of! Unfortunately, we only know what media shows us- Modi Vs Gandhi ; who is better at brewing political advantage out of such a tragedy; stories of pilgrims’ pain , their anger, survivors’ stories, rescue operation ...we know quite a bit! What we do not know is the fate of Shiva who does numerous odd jobs in Uttarakhand during yatra season to earn money or the fate of Rama who relies on subsistence farming during cropping season and stocks his produce for the entire year. 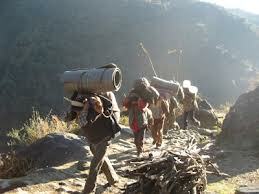 Yatra or pilgrimage season is the only main source of annual income for Shiva’s household. He carries children and old people, he runs a roadside tea stall, he sells chips, biscuits, and he works in hotels- he does everything to ensure maximum earnings so he can sustain his family for the entire year. Rama, on the other hand, has nothing to do with pilgrims and tourists. He is a local farmer. He has a small agricultural land along with some farm animals. He tries to grow enough crops during peak season so that he can sustain his family for the entire year by storing crops. Today, Rama’s home, land and animals have all been washed away by the flood. There are thousands of Shivas and Ramas in Uttarakhand who rely on seasonal agriculture and employment and manage their households for the whole year based on the income they earn during this time. Flash floods have swept away many pilgrims and tourists and many Shivas and Ramas have gone missing. Nobody knows the fate of Shiva or Rama, and possibly we will never know as nobody is looking for them either. Worse, with government's plan of mass cremation, probably their death will not even be counted. What is really heart-rending is that even if Shiva or Rama is alive today, the livelihood of his household has been deeply affected. The Government has just announced that there will be no yatra for at least two years due to destruction of roads, bridges and other infrastructure. Worse, the flood has destroyed many agricultural lands. Until the restoration of the state is over (and we do not know when), nobody knows the alternative sources of livelihoods for local people like Rama and Shiva. There is no doubt that stranded pilgrims need to be evacuated, and should be given proper medical care. In no time, the surviving pilgrims will return home, the dead will be mourned and the media will move to another sensational story. We will hear the media, the experts and the government officials raising questions about riverside encroachment, disaster management system, weather warning system and other endless discussions but they will do what they do best- lay blame on others. However, nobody will pay any attention to the plight of Rama and Shiva, who are probably the worst affected. They have lost their loved ones, their homes, lands, crops, and most importantly, their livelihoods for an indefinite time. With prayers for their future, I hope, the Government realizes that this ignored population requires a substantial boost at this point to sustain their livelihoods. In addition, I request all readers to show your support to Uttarakhand relief work and please encourage all to reach out to the likes of Ramas and Shivas! !